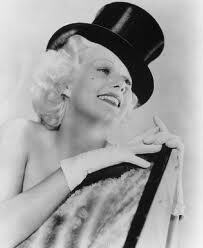 Love this photo of Jean Harlow in a top hat. The hat was probably vintage in style at the time- the belled shape of the crown was more fashionable around 1900 rather than in the early 1930s when this photo must have been taken, when straighter-sided crowns were more common. The fact that she's wearing not much else reminds me of those funny Brook Shields / Calvin Klein ads from the early 1980s.